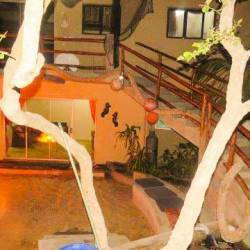 Wakene House (Bella Casa) in Ponta Malongane can accommodate up to 10 guests. Rates from R300.00 per person sharing. 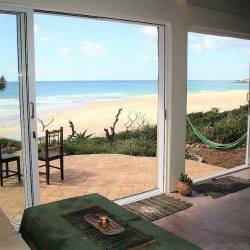 Wakene House (Bella Casa) is situated within the secure Wakene Beach Estate in Ponta Malongane, the beautiful village on the southern shores of Mozambique. This comfortably furnished and well stocked privately owned holiday house can accommodate up to 10 guests in 3 bedrooms. The 2nd level has 3 bedrooms with 2 bathrooms, one of which is en-suite. The top level, nestled in the dune canopy, has a fully equipped kitchen with ice machine, microwave, electric and gas stoves, 2 fridges and a chest freezer. In addition there is a full living area with indoor dining and lounge with 2 additional single beds. Two of the bedrooms have double beds, the third bedroom has 2 sets of bunk beds and there are 2 single day beds in the lounge for extra guests. The bright and spacious fully equipped kitchen with a breakfast counter opens to the lounge area. 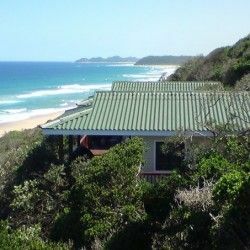 This unit is special in that it has a 360° view with its location on the highest dune, there are limited sea views because of the forest canopy - but spectacular sunset views over the Coastal Forest. A wooden walkway leads guests down the dune to the beautiful pristine beach below. The house we stayed in was great. Very Clean. Very private. We had all the kitchen stuff and bedding we needed, Braai was perfect, the maid came every day and cleaned beautifully. The upstairs outside deck was great for socialising and eating. It was quite an uphill walk from the beach but other than that I have no complaints. The beach was incredible. Nice swimming beach as well.